Peter Vesterbacka, a co-founder of the enormously popular game Angry Birds, talked with Petr Kanayev of Gazeta.Ru about new games, the might-have-been deal Russia’s DST investment fund, and why he is not going to storm Wall Street. Gazeta.ru: Is the Angry Birds business still growing – or are the indicators less impressive than before? 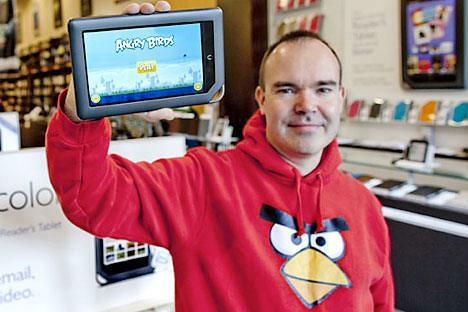 Peter Vesterbacka: The indicators are indeed growing and, now that we have signed a partnership deal with Nokia [the Finnish corporation recently announced that on the new Nokia Asha line, which targets emerging market consumers, would have Angry Birds pre-installed on it]. I hope they will grow even faster. We get new users from India, Latin America and Africa, and Nokia sells a very large number of phones. Gazeta.ru: So what sort of growth rate do you have in mind now? P.V. : We have 1 million to 1.5 million downloads per day, and we are looking to have several million. The site is growing at an amazing pace. Gazeta.ru: It seems the time is right to disclose your financials. P.V. : So far, our policy is limited to just giving the number of downloads. Gazeta.ru: Aren’t people getting tired of your pigs, birds and monkeys? P.V. : No, people love them. They tend to play more now than ever before. P.V. : I also love the things I do. I am really attached to this brand. Gazeta.ru: Will there be new projects and new gameplay ideas? P.V. : We have lots of new ideas. And we will have several new games; we are working on them now and plan to launch them soon. We are also involved in animated projects. We are also working on a few books, specifically a cookbook. It will be published not only in English but also in Russian, Chinese and a few more languages. Gazeta.ru: Any plans to expand your staff? P.V. : Yes, we have created about 100 new jobs. We welcome Russian programmers, among others. Gazeta.ru: Might you consider opening an office in Russia? P.V. : I might. Or it might be easier to invite Russian specialists to our office. Who knows?! Gazeta.ru: Is Russia high on your business priorities list? P.V. : It is a good market with vast potential. There are two sides to this market. For one thing, a lot can be done right here in Russia. Second, a lot can be done on the global market by engaging Russian programmers and partnering with Russian companies. Gazeta.ru Do you have any complaints about the investment climate? P.V. : It is obviously a bit too tough. Anyway, there are problems everywhere. Take Europe – there is no single market for digital content, which includes games. In the European Union, there is a single commodity market, but no single digital market yet. This is an obstacle. It is a shame that European functionaries are incapable of addressing this problem, which seems relatively minor compared with all the other issues. Gazeta.ru: Have you considered engaging an investor to develop your business – a strategic partner or investment fund? P.V. : We are indeed a very profitable company. We are focusing on expanding our business, especially in Russia. We are in talks about selling stuffed toys, board games, books, etc. under the Angry Birds brand in Russian stores. Gazeta.ru: There have been reports on the Russian Internet market about the Russian DST investment fund’s interest in Angry Birds. Have you had negotiations with Yuri Milner’s structures? P.V. : I know Yuri very well. We discuss our development scenarios with everyone, including with DST, but it was long time ago and we are not in talks now. Gazeta.ru Do you still look towards a stock exchange listing? P.V. : These plans remain but not for the near future. We’ll see what happens next year, but I can say for sure now that we are not ready for an IPO. Gazeta.ru: Has the new wave of the crisis, which politicians and economists already call a fact, affected the online game industry and your business? P.V. : People need to relax and be entertained amid any economic developments. The iPhone application costs just 99 cents. This small sum of money can buy you many hours of fun. This makes the game industry quite competitive, despite the recession. Gazeta.ru: Have you personally been affected? Don’t you want to join those who plan to capture Wall Street? Do you share this spirit of protest? P.V. : It is OK for people to be active and start doing something, but I have strong doubts that the world’s current predicament is caused exclusively by Wall Street and certain specific bankers. We should not make it appear too simple: It is all much more complicated than that. In fact, the reason behind most of the problems can be found when we look in the mirror.